I sometimes wonder if I don't prefer volume 1 simply because it was the only book I had with me for a month long vacation and I just read it again and again and again. The two volumes never really felt like two halves of one book, though put together they certainly create a whole. Your thoughts on Maus, even when they do not match my own, are quite interesting. These posts certainly make me want to go back and reread the collection. I have read neither book, but now am really curious to compare them. Still not sure that these are for me but I'm glad you had a better reading experience with this one. 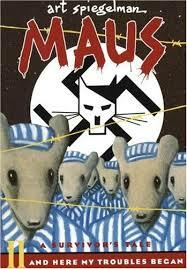 I'm definitely going to read The Complete Maus if and when I decide to read these books. I've linked to this post on the WWII book reviews page at War Through the Generations.